Having a walk in a sunny afternoon is surely one of the things I like the most...so you can imagine my surprise when it went all foggy around me that you could barely see anything ! Well, it wasn't hard to see me even in the Mist, since I had chosen a color block outfit ;-). Bag: Balenciaga City "Mini Giant"
You can find most of this stuff at Macys with these exclusive promo codes! I opted for colored tights (Calzedonia) with this lovely Diane Von Furstenberg dress, the color of the dress is a sort of lime green and it wasn't very easy to match with another color. I could have gone for black tights and pull but I thought a cobalt blue match would be more original and fun :-) and I had this nice Zara turtleneck that was perfect with the tights !. 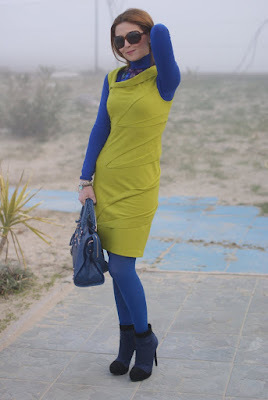 My beloved blue Balenciaga and the Icone ankle boots you had already seen previously completed the "fog-proof" look. Mind you that my hair had a lot of volume and with all this humid weather they lost it...I am always very hair concerned, I have tons of products at home to prevent them from going frizzy with humid seaside weather, do you also hate it or is it just me that hates it that much ?. Ho optato per calze colorate di Calzedonia con questo adorabile abito di Diane Von Furstenberg dal colore verde lime, non facilmente abbinabile ad altri colori. Avrei potuto scegliere calze e pull neri ma ho pensato che un abbinamento con il blu cobalto sarebbe stato più originale e divertente :-) e poi avevo giusto questa maglia a collo alto di Zara, perfetta per l'occasione !. La mia adorata Balenciaga blu e gli stivaletti bicolore di Icone che avevate già visto in altre foto hanno completato il look "a prova di nebbia" :-). La mia preoccupazione pricipale era per i capelli, con l'umidità perdono volume e si increspano, ho un sacco di prodotti a casa per prevenire l'effetto crespo tipico dei posti di mare, lo odio troppo e voi ?. Talking about color block, I have to share with you something I saw in a local shop and was so tempted to get...a wonderful Marc Jacobs bag, this would match this outfit even better than my Balenciaga ! 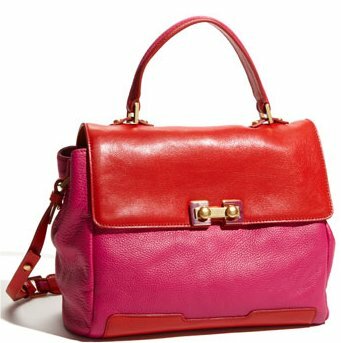 I am getting more and more bagaholic, I have to calm myself a bit, so I tried to convince myself I didn't need this bag in my life...but I am a very passionate girl and the more I think about this bag the more I feel I want it ! It's the Marc Jacobs' "Bob's Memphis Trip" satchel in color block (you can see two versions here...which one do you prefer ?). I love them both !. Who knows, maybe soon or later it will be added to my collection, for now it's officially on my wish list !. Parlando del trend color block, devo condividere con voi una borsa che non riesco a togliermi dalla testa e che credo sarebbe stata ancora meglio con questo outfit...sto diventando sempre più fissata con le borse, mi devo dare una calmata, ho continuato a ripetermi che non ho bisogno anche di questa borsa nella mia vita ma più ci penso più la voglio ! Si tratta della Marc Jacobs "Bob's Memphis Trip" nelle doppie versioni di color block...quale preferite ? A me piacciono entrambe ! Non so se prima o poi riuscirò ad averla ma l'ho inserita ufficialmente nella mia wish-list ;-). 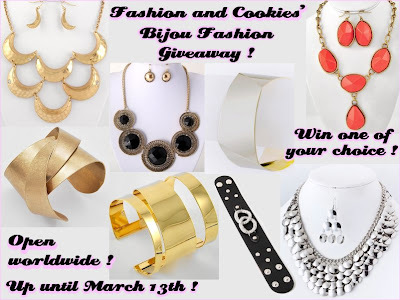 Don't miss the opportunity to enter the amazing Bijou Fashion Giveaway, there's a chance to win a beautiful fashion bijou of your choice among the eight ones you see in the image ! The giveaway is open internationally until March 13th, to enter fill in the Rafflecopter form you find here !. 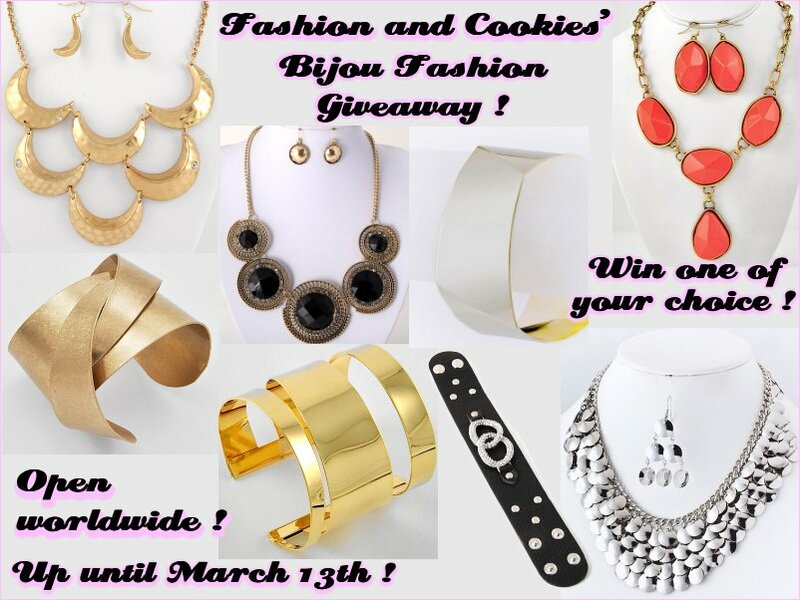 The winner will be announced on March 14th on this blog :-). 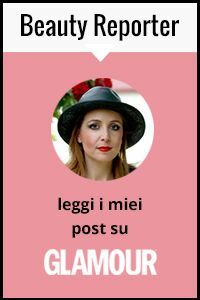 Non perdete l'occasione di partecipare al bellissimo Bijou Fashion Giveaway e avere la possibilità di vincere un bellissimo bijou a scelta tra gli otto che vedete nell'immagine ! Il giveaway è internazionale ed è aperto fino al 13 Marzo, per partecipare riempite il form di Rafflecopter che trovate qui !. Il vincitore sarà annunciato il 14 Marzo sul blog :-). i love this look! so bright and cheerful! Che bei colori! Molto originale e carino! :) Baci! Yeah, colorblocking!! *___* I love that Marc Jacobs bag!! great colorblocking love!!! the chartreuse and blue colors are electrifying together! Quest'bito ha un taglio strepitoso! These boots are to die for!! Great post! You look great in those smashing colours! 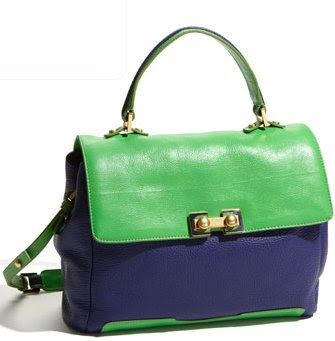 Great choice for color blocking! The dress is amazing and I like it with the blue! You look fantastic! this outfit is simply amazing - I love those 2 colors together - now if you would have put some pink shoes or booties, that would have set it off for me - I love it - nice!!!! I love this dress, perfect colour and shape! A very important post on my blog..you should watch it! please watch and spread, thank you so much!!!! Sei sempre molto autoironica e per questo mi piace leggerti, io sono in fissa con il blu elettrico perciò approvo appieno questo look! Those colours look fantastic together! Tesorooo... sei bellissima, anche se, sono onesta, per me i colori sono troppo troppo forti! Adoro quella borsa di MArc... ma marc è marc! Mi piace il tuo outfit, decisamente originale! Pure io detesto l'effetto crespo ai capelli! Grrrrrrr..
Great outfit and I love the way you've colour blocked! Bold and beautiful. such an eye catching color combination. love your balenciaga! Oh nice, I love it! so bold! Great pictures and combinations, love it! about bag i prefer the second one. 2 of my favorite colors! LOVE this! e devo dire che la borsa blu e verde è davvero bella,capisco che tu nn riesca a resisterle! che stile che bella la borsa...wow..
sono una tua follower su bloglovin..
se ti va passa sul mio blog a lasciare un commento positivo sul contest sissirossi..
Bellissima la borsa di Marc Jacobs! Io preferisco la versione rosso-fuxia. bellissima la balenciaga di quel colore! ey ! It wasn't easy but I did all steps ! Thank your for your comment on my blog ! Don't hesitate to follow me ! Oddio mi sono innamorata della borsa di marc jacobs, mi piace da morire in entrambi le combinazioni di colori!!! This is such a stunning color of green! And your look is beautiful.. I am loving those bags!! Lovely outfit! thanks for the comment. I will follow you! I follow u now on gfc and bloglovin!